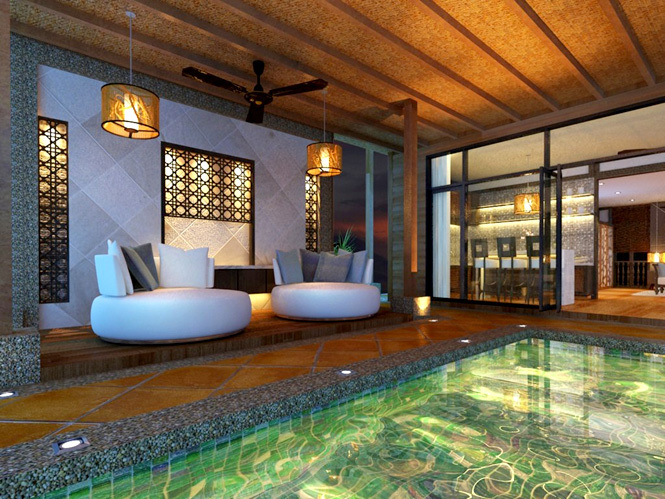 A living room in one of the villas. 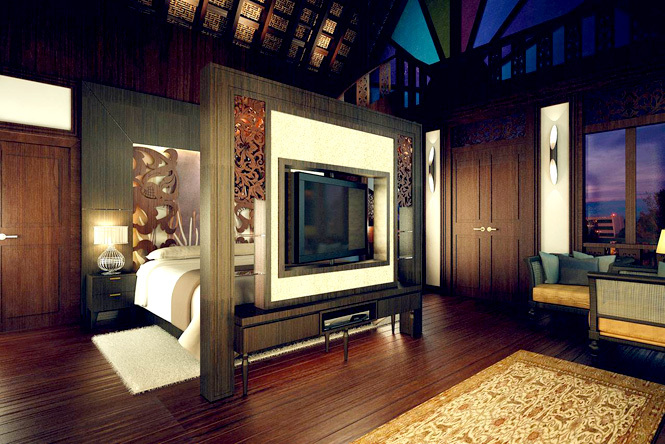 Rumah Terengganu Living & Bedroom. Above: An aerial view of the resort. 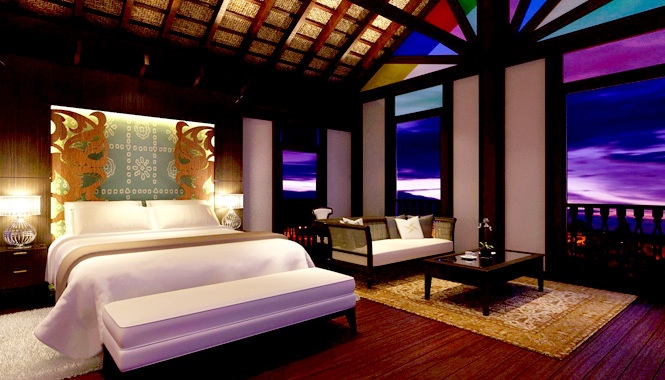 From the Four Seasons to the Datai, the Malaysian island of Langkawi has no shortage of luxury accommodation. 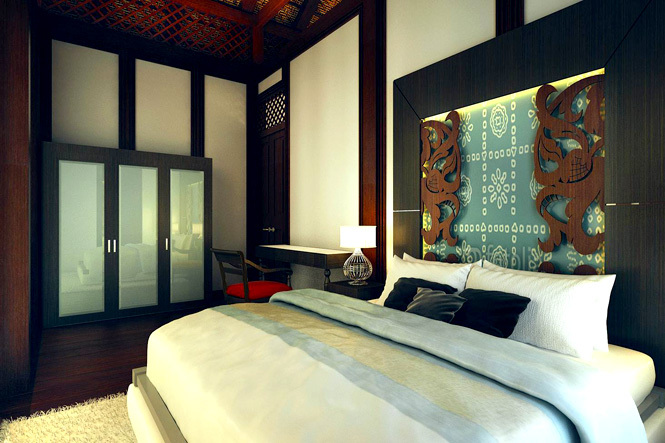 But an upcoming boutique resort aims to combine luxury with a traditional Malay experience. 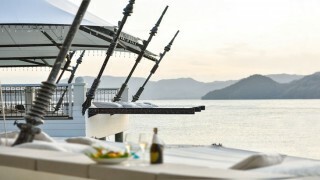 Located on the banks of Kuala Chenang River next to Chenang Beach, the Seri Chenang Resort & Spa Langkawi features six villas, each a unique replica of a royal house from a different Malaysian state. 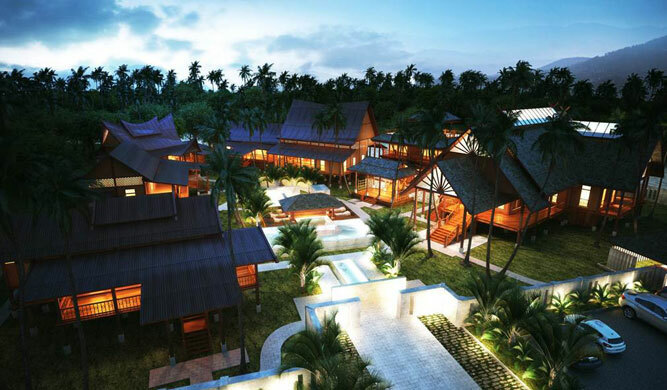 The villas are made with high-quality wood and showcase Malay architectural heritage. 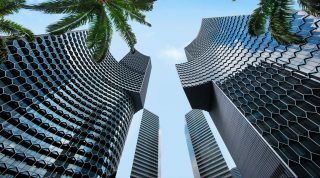 Sizes range from one- to five-bedrooms, space from 113 to 393 square meters. 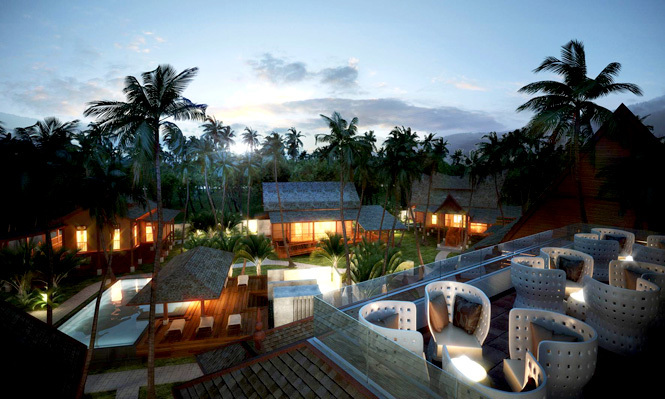 The resort features views of mountains, lush greenery, and the Andaman Sea. A viewing deck is the best place to soak up the scene. 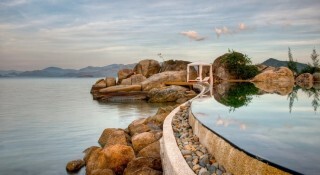 Facilities include an infinity pool, a fitness center, an art gallery, a boutique, a reading room with mountain views, and a spa that uses Malay herbs grown in the resort gardens for treatment remedies. 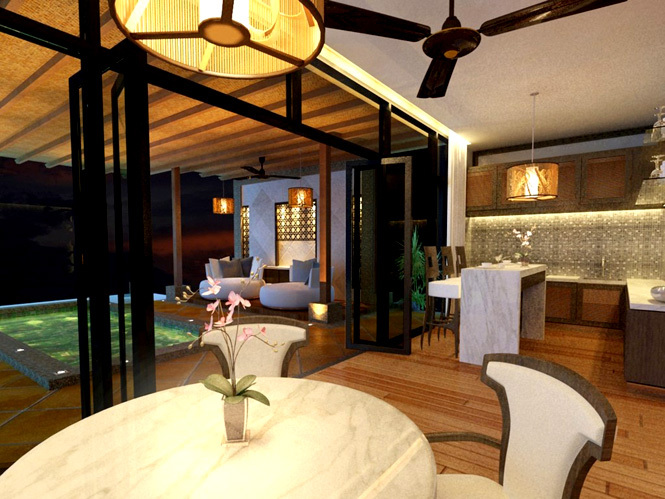 Each villa has its own kitchenette, and there’s a common dining area based on the kind you’d find in a traditional Malay village. In the evening a woman stops by to prepare tea and make traditional Malay delicacies while chatting with guests. 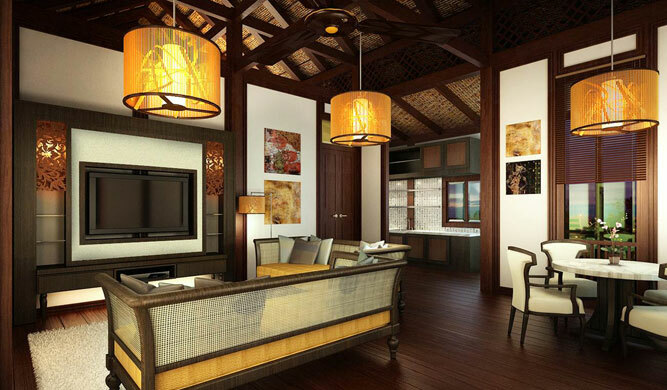 At mealtime guests are given batik sarongs to wear to enhance the feeling of being in a Malay village. 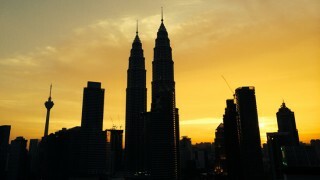 The fare is a fusion of Malaysian and international cuisine. Dining is also available by the pool or in the villas, gardens, reading room, or viewing deck. The resort provides complimentary airport transfers in a Mercedes, bicycles to tool around in, and free shuttle service to various destinations. Plus it rents out a colorful Mini Cooper. 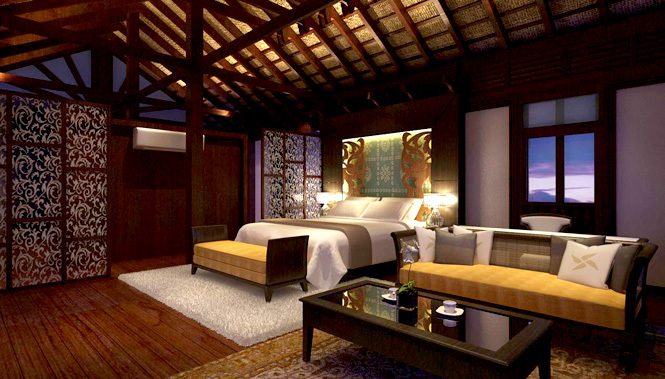 A 24-hour butler service is provided with each villa, reachable via the handsets provided at check-in. 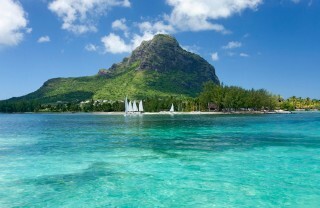 The resort is scheduled to have a soft opening on May 31 and a grand opening on June 30. Pricing and other details will become available closer to the launch date.